Dazed Digital: The video is pretty crazy, what was that all about? Midnight Juggernauts: It has a weird story, we were shooting a video in the US but it fell apart three weeks before, so we rushed to get a new idea... It's based around the album artwork so it's all a physical construct not like Photoshop, so it's the album artwork that comes to life. It's based on this visual technique called split-scan to create a really warped music video, like based in the real world but with a twist to it, with us playing in a sculpture that comes to life. DD: You guys have been making music for a while, how do you feel the sound in 'The Crystal Axis' differs from your last album? 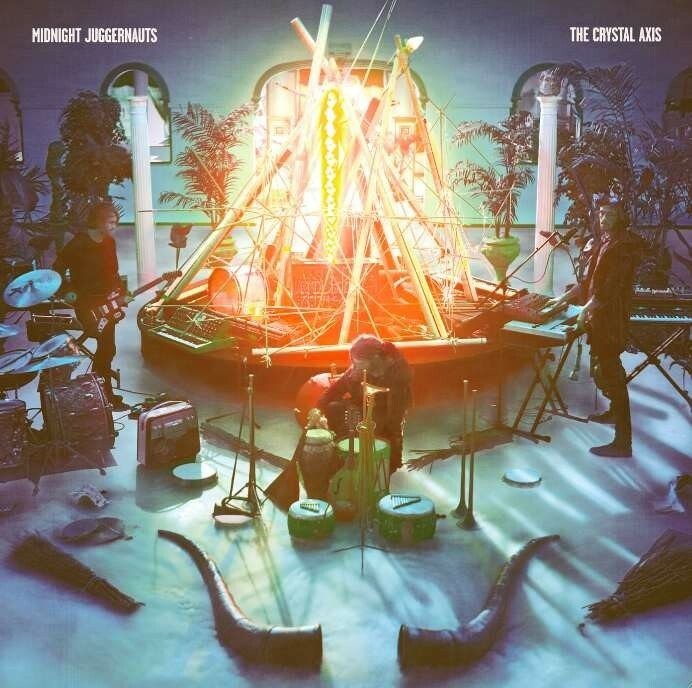 Midnight Juggernauts: I suppose it has changed, it's quite different sounding to the last one. We were away for a long time touring, spent a lot more time playing and writing things was very seperate. We were jamming a lot more together, so it's a lot more of a live, raw sounding record. When we came back from 2008, we didn't get much of a break and had to carry on touring, so it's probably not as dancey, less of the straightforward 4/4 rhythm, more experimental and it's all live, everything. DD: Was everything live in the first album? Midnight Juggernauts: Yep but it was more sequenced - using computers, instead of live to electronic. Midnight Juggernauts: Institubes released your first stuff yeah so I guess that came about when through the internet and it did help kick start us and give us a following in France - I suppose the new record stems from this beach house. DD: So what are you listening to now? Midnight Juggernauts: We all have different tastes but like I guess I was listening to this 70s band, Brain Ticket a lot. We listen to all really different genres, like this world music stuff like Cambodian, a lot more percussive sounds, and a lot of 70s pop. DD: There's a big scene for that electronic sound in Australia like The Presets, Cut Copy, etc- are you all pals or is there some sort of rivalry there? Midnight Juggernauts: We're all good friends, played a lot of shows together, touring and remixing each other- a lot of Aussie acts don't end up touring outside the country, but they're more interested in playing other countries- like Belgium or Denver or weird places. We all started from the same place, but have all gone in different directions. Maybe it's not intentional but it's just how it happened? Midnight Juggernauts: Usually seperately, but we've stopped doing remixes during recording and focusing on our own material. We get so many offers and we love doing it - just getting a song and turning it inside out, but the most recent one we did was for Tame Impala. Midnight Juggernauts: Basically we're preparing for Europe - playing lots of shows, looking forward to touring again. We were so based in the studio before and now we're testing out new songs so venturing them through the world always appealed to me. But of course this is still the honeymoon period! By the end of it you wake up and you're like where am I? I'm really excited about playing live, seeing how the songs evolve. It's a lot more prog-based and there's more tangents when you play them live, they're all different. We have a lot more equipment now so it's gonna be fun this year. The songs take a life of their own. DD: You tend to have quite a spacey sound that's reflected in the artwork, was this intentional? And so we left it on that note.